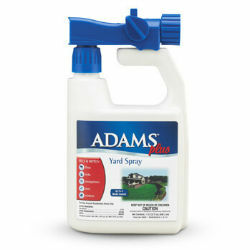 Kills fleas, ticks, mosquitoes, and ants and also stops bugs in your lawn, trees & shrubs, roses & flowers, and gardens. Kills adult fleas, hatching flea eggs, flea larvae, ticks, cockroaches, ants, spiders, mosquitoes, and silverfish. Protects from fleas for up to 4 weeks. Easy to apply. Treats up to 5,000 sq. ft.